How To Blog Without a Website? Then - Use Pinterest and Instagram to Promote! Are you looking for ways to monetize your creativity, knowledge, or experiences and make money online? If you are a stay-at-home mom, a nomad, or anyone looking to make money online, you have probably considered blogging. Some of the links below are affiliate links. This just means that if you choose to make a purchase we may receive a small commission, at no extra cost to you, which will support VENNDY's expenses during the free beta stage. We are using these links also to show case how you can use VENNDY’s tools for your affiliate marketing reach. I was in the same boat a few years ago. I am not really sure what my main reason was for starting my online entrepreneurial journey. Was it the need to make a living as flexibly as possible, the urge to bring more creativity into my life, or my desire to connect with other like-minded people? I guess it was a combination of all three. I started blogging only to find out how time-consuming it can be and how difficult the learning curve. You’ll find endless blog posts about how to make money blogging, and many bloggers do make a living from their blog. 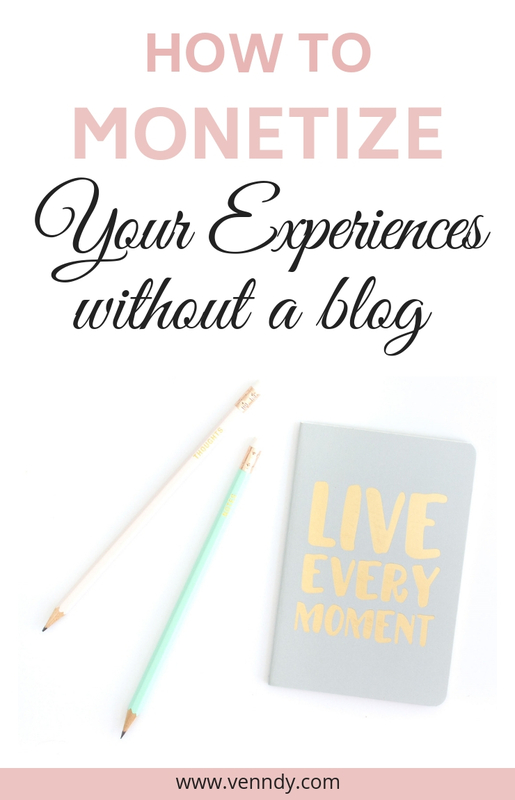 There are many ways to monetize a blog, as I explain in our blog post 8 Easy Ways To Monetize Your Blog. In order to make money via advertisements on your blog your site needs to have a significant volume of traffic. You can start using AdSense from the very beginning, but ad agencies like Mediavine require over 25 thousand in monthly pageviews. Even if you do not have massive traffic, you can still make money with affiliate marketing, as long as you have an engaged community and followers who keep coming back for your advice. This post is all about how you can make money and use affiliate marketing, not necessarily with a blog. Micro blogging and social media are some of the alternatives (mainly Pinterest and Instagram, as discussed later on this post). And as to building your own product – this is a very effective way to monetize. When you create an e-book, course, or other products, having your own blog can be very important for promoting them. 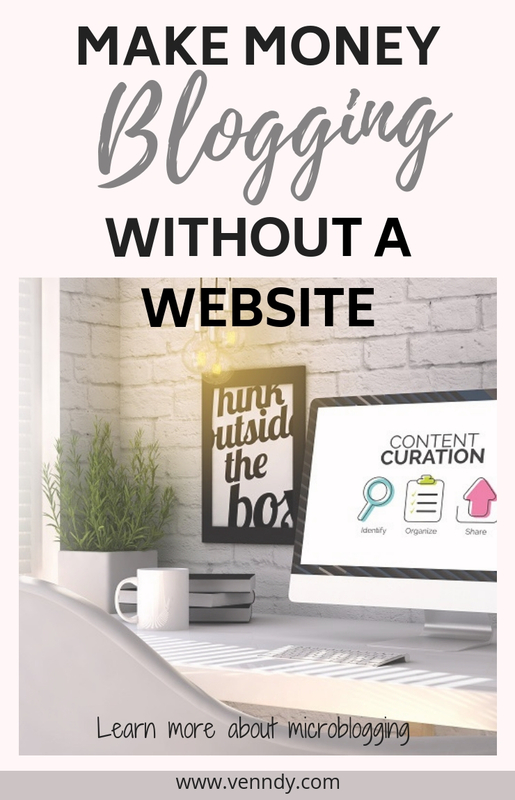 Before I get to the alternatives for having a blog, I would like to start by saying a few words about blogging because it is important you understand all your options. There are many ways to blog and quite a few blogging platforms. Having your own blog gives you more flexibility on how the site looks: the design, outline, categories, and more. Many bloggers suggest going for a self-hosted website in order to have full control over your blog. This is absolutely correct, provided you have made up your mind to invest the time and some money needed to blog. A self-hosted website allows you to offer products, create opt-ins for growing your email list, and sign up as an affiliate to those programs which require having a website for use of their affiliate links. However, it also requires a commitment (of time, money, consistency, and skills) before paying off, so you may want to consider the alternatives suggested in this post. Bottom line: Blogging is great as a creative outlet, if you have special knowledge, expertise, unique taste, or a passion for writing. But if you are blogging to make money online, you’d better be prepared and up to the challenge! If you are ready to take the next leap and start your blog, head over to our resources page where we share some blog posts, platforms, design themes (like Creative Market), and more. We also LOVE this blog post with the insights of a new blogger and her journey from the moment of decision making to a month after launching her blog. So, now that you’ve decided to blog, the next step is to promote your blog and your work. What’s the point in creating a great blog if no one sees it, right? Your first year or two will be split between creating content and promoting. I am by no means trying to discourage you but rather to help you prepare and be ready for the effort involved. There are so many advantages to blogging in addition to being one of the primary ways to generate affiliate income. You need to be prepared for endless numbers of hours creating content until you hit the milestones of certain sums of money hitting your bank account. This is still a blog, only instead of being self-hosted, it gives you a blog domain for free and it is hosted on the platform you join. For example, WordPress.org, Wix, WordPress.com, Blogger, Squarespace. There are pros and cons to using a blogging platform, but in terms of the amount of effort and promotion needed, they are no different from having a self-hosted blog. Check out this list: Top 15 Free Blog Sites For Creating Free Personal Blogs Really Quickly. Microblogging is a general term defined as the practice of making short, frequent posts to a microblog. Tumblr and Medium are somewhere in between a blog and a microblog. They are popular personal blog sites. Use Tumblr if your content is more visual and you mainly want to upload images. Medium is great for writers sharing their ideas and thoughts. Twitter, Facebook, and even Instagram are examples of microblogs, as they are built on short text and images with an emphasis on connecting with others. 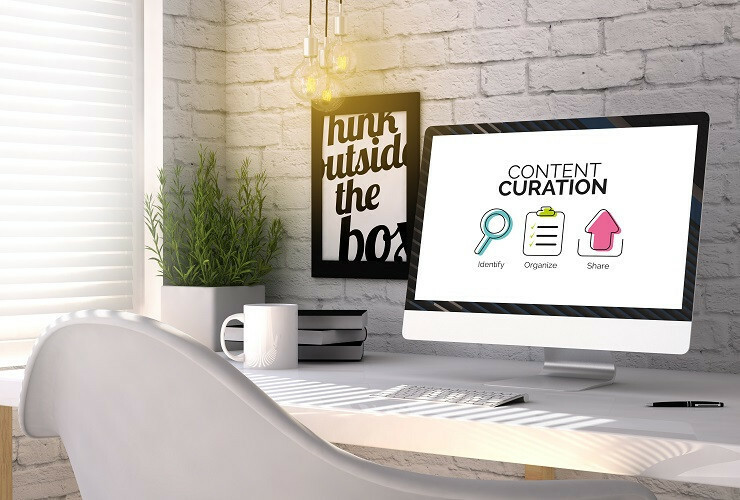 Microblogs differ from traditional blogs in that their content is typically smaller in both actual and aggregated file size, and they therefore allow users to exchange small elements of content. This may be a key reason for their popularity. Not all microblogging platforms allow using affiliate links and not all affiliate programs will accept you as an affiliate if you apply only with your social media accounts. However, more affiliate networks and programs appreciate the exposure on social media, and therefor ShareASale or AWIN for example, may approve your application without a blog, provided you post consistently high quality content. You can read our post about Affiliate Marketing – Best Practices: Are You Ready To Join? to learn if this can be a good fit for you. Also, check out The Best Affiliate Networks and Programs For Beginners to see which networks you can apply if you do not have a blog. You can build an online shop using ecommerce sites such as BigCommerce, Shopify, WooCommerce, Gumroad, and others. These platforms are good for selling your own products, either physical or digital. Carousel is powered with VENNDY. VENNDYis a new service that falls somewhere in between microblogging, social networking and an online shop. It is more like a microblogging platform in terms of its setup, layout, and pre-defined categories, but it is focused on shopping and making money online even without having your own products. If you have a blog you can use its features to easily share your affiliate content, but you can have your affiliate marketing free destination even without a website. VENNDYis designed as a social curation site, where you gather all your loved products in one place and promote them using the affiliate marketing network of your choice. No inventory, no cart and payments, no shipping, no returns. It is about sharing your ideas, experiences, and reviews on everything connected to lifestyle and related services. It's more like a social marketing platform. A page is created for every item you upload, where you can add your review and rating. For Instagram – create an Insta shop tab. For Pinterest – create lists or a collection of items around an experience or a subject such as: "Best UGG look-alike boots,” "20 beautiful pink and gold home décor items,” "Must visit hotels in Japan,” etc. For Facebook – create a story, all organized in a shop-like layout, allowing your audience to shop for your favorite finds or latest adventures. For YouTube – create an affiliate marketing shop and direct your audience to search, shop, or save all your recommendations. All you have to do is promote your favorite products, places, and services and connect with like-minded audiences, helping them to make the best possible purchase decisions according to their personal taste. You can learn more about VENNDY’s tools here: the LinkCollector, the Collection of Items (Story), the Shop-the-Post widget, the Resources Page, the Insta Shop gallery without a blog, and the Insta Shop gallery for your blog. You know how valuable is a recommendation from a trusted friend!? Connecting with others based on genuine honest reviews is priceless. We are more likely to trust a review from someone like us, and this is why the more people share their experiences the greater are the chances that we can find like-minded reviewers. To make money on VENNDY you still need to apply to be an affiliate. Learn more about how VENNDY works HERE. So, as you can see, if what you are looking for is to make money from home while sharing your knowledge, expertise, and passion, there are a few alternatives to starting a blog. Social media, especially Pinterest and Instagram, are a great way of reaching new people. Read more about how to monetize on Pinterest here and on Instagram here and here. However, with all the algorithm changes taking place on Pinterest and Instagram, it is an advantage to have an outlet which you can promote independently. VENNDY answers some of these needs with blogs and sharing ideas, products, places, and services while creating a layout focused on monetization. You can then use social media for promoting your content with or without affiliate links. VENNDYfocuses on exchanging practical everyday ideas and products and, as a creator, making money from the information you share through affiliate marketing. Share the tips you usually share with friends and family with a larger audience, and earn commissions on sales made through your promoted products places, and services. WHO IS VENNDY GOOD FOR, EXCEPT FOR BLOGGERS? If you are a savvy shopper, fashionista, interior designer, or a foodie, or if you love travel, fitness, or any other lifestyle related category, you can now share your finds easily with a larger crowd on your social media and with other VENNDY community members. If you feel you have valuable knowledge that can be shared with others. If you want to share your experience and insights as a mom who has learned so much about parenting and earn money online while staying at home. If you love writing reviews, you can gather all your reviews in one place and build your authority in your specific area of interest. If you are not sure about blogging and want to try something in between. Everything you create can be a great foundation for creating beautiful widgets for your future blog posts. If you love Pinterest and Instagram but don’t see the practical side of it. VENNDYis built in a shop-like layout, so you can neatly arrange all you finds, making it easy for both you and your readers to follow. WHO IS VENNDY NOT GOOD FOR? VENNDYis not a quick fix for making money online! You need to create great content (even if it’s only lists of products), engage with others, and build an audience that is interested in hearing what you have to share. If you don’t do this right, your interaction with VENNDY won’t get you very far. VENNDYis not good if you mainly want to write and are looking for an outlet for your writing. Medium may be a better solution for you. VENNDY is about sharing experiences and building lists, where your reviews, personal taste, and opinion are key to the purchase decisions of others. It is great for connecting with others around topics of mutual interest and together building comprehensive lists of places, services, and products. It also gives you a way to collaborate with others, as everyone puts their content on the same platform while keeping their monetization efforts separate. 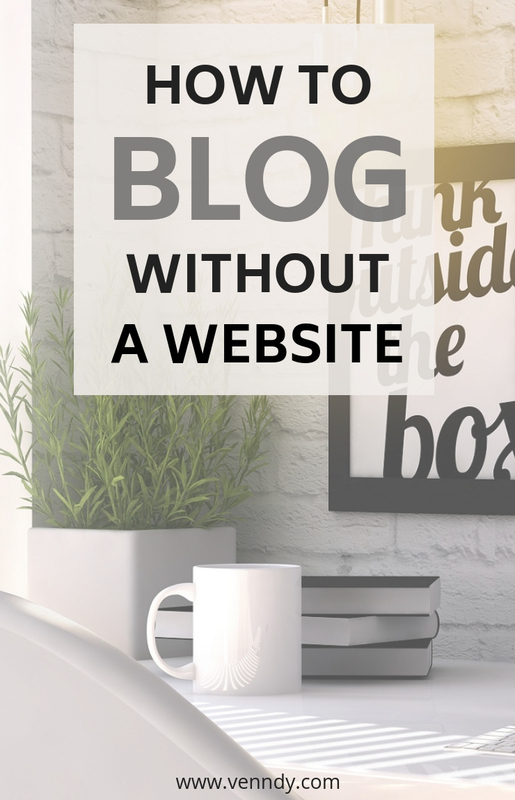 If you look around, you’ll notice that there are many people "blogging” without a website. They blog through free blogging platforms, microblogging sites (Tumblr, Medium, etc.) and social medias sites (Pinterest, Instagram, Twitter, Facebook, and YouTube). If you are ready to turn your hobby into a source of influence and even a money-making outlet, check VENNDY and learn more. DO YOU NEED A BLOG FOR BUILDING YOUR DIGITAL ASSETS? One of the reasons why blogging has grown in popularity is the recognition that having an online presence with a following and monetization method is an asset. When done right, a digital asset, like every other asset, has many advantages. Many believe that a blog is super important for being able to monetize. This may be true as many brands looking to work with influencers want to see proof of their work and invest in longer-lasting promotional efforts. Not all brands require a website for becoming an affiliate, but some (Booking, Amazon) still see it as a prerequisite. However, we are seeing more and more Instagram users who are making a living from their social reach without a blog! Likewise on Pinterest, especially since mid-2017, when Pinterest approved the direct use of affiliate links on their site. There are Pinterest accounts arranged to look like a shop that can help people find the things they are looking for. 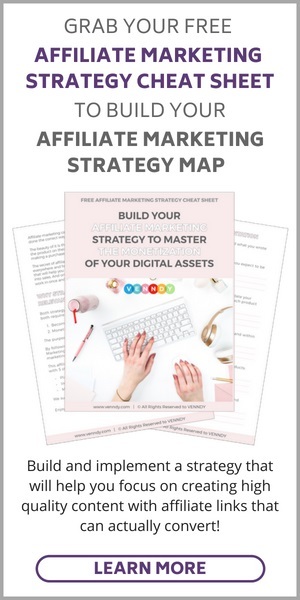 With Instagram and Pinterest frequently changing their analytics and approaches over the past few years, it isn’t hard to rely on them for your online income and monetization. Neither were organically built for monetization from the start, and this makes it harder for users to find items efficiently or speedily or to explore the feed in a shop-like manner. That’s why you need a place – like VENNDY – to store all your e-commerce related content, recommendations, and reviews. You can read more about the advantages of using VENNDY in this blog post and sign up to check out how it works here. You are not ready to commit to starting a blog but are looking to share your experiences and letting your voice be heard. You dream of getting paid for your knowledge and the ideas you are passionate about. You dream of impacting not only your friends and family but reaching out to a community and connecting with thousands of people. You believe that impact comes from collaborating with others. You dream of having the freedom to do what's most important to you, like picking up your kids from school every day or traveling the world. Let me leave you with something to think about. The moment you are ready to challenge the status quo and open your mind to different ways of answering your needs is the moment you will start seeing new opportunities coming your way. If you are ready to give it a try and to check how VENNDY can answer your need to share your passion, expertise, and experiences, head here and sign up.